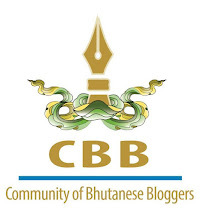 In Bangkok it's honor to be a Bhutanese; people change their tone and expression when they hear that we are from Bhutan. They come closer and talk like they always knew us. They talk about how they love our 'king Jigme'. From security guard to cab driver, from barber to waiter, everybody knows our king and his beauty. A cab lady who was driving us from MBK to hotel looked tired and angry until she heard us mention about Bhutan. She suddenly beamed with smile and gave us 50% discount without we even asking. The barber I had haircut at called whole her family to talk to us and they showed us the street through which our king passed. Thank you your majesty, you have not only given us a great country to live in but also the license to travel abroad with honor and pride of being Bhutanese. 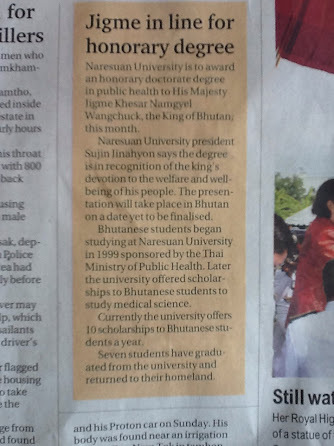 This morning Bangkok Post carries the headline: Bhutan King Honoured. Inside in a light orange box they have news of Naresuan University's honorary doctorate degree in Public Health to our King this month. Wow! Nice to hear all this. The charm of our King in Bangkok. Let's express thanks to our King. I love travelling in Bkk because people treat us so well upon mentioning the name of Bhutan. I feel proud to be a Bhutanese.